John D. McCabe had a vision for a full-service funeral facility in Punxsutawney, one that would be a trendsetter in funeral service. That dream became a reality with the opening of his spacious modern facility, the McCabe Funeral Home on August 22nd 1999. Today, the facility continues to grow and serve the residents of the Punxsutawney area. In addition to owner John D. McCabe is Lisa Waldron, funeral director and manager of the funeral home. John’s son Brian has joined his father at the funeral home. 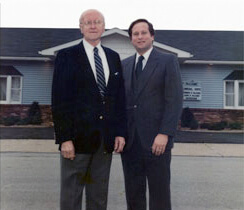 Brian follows his late grandfather, Howard S. McCabe, licensed funeral director for 52 years, and his father John D. McCabe, licensed funeral director for 33 years, in funeral service. John and Lisa are also grateful for the services of staff members Martha Monoskey and Joseph Buterbaugh.